If you have been reading my blog, you would know that I was lucky enough to have been invited to watch La Cage Aux Folles early of February this year. I was so head over heels in love with amazement at this show that I really wanted to tell my theatre friends to catch it but unfortunately it ended too soon. Lo and behold, and maybe because I have been pretty good lately, my answers have been answered. La Cage is actually doing a RE-RUN. A fun, frivolous romp through the streets of Saint Tropez and the French Riviera, the Tony Award-winning musical which returns to the RCBC stage from August 15 to September 6, 2015, follows the story of night club owner Georges, played by TV and film actor Michael de Mesa, and his life partner and the club’s star performer Albin, played by veteran stage actor and PHILSTAGE president Audie Gemora. When the former’s biological son Jean-Michel (played by TV actor Steven Silva) brings home his fiancée Anne (played by Missy Macuja-Elizalde and Joni Galeste) and her ultra-conservative parents for a matrimonial téte-a-téte, pandemonium ensues, leaving no stone unturned, no feather unplucked, and no sequin unpolished. 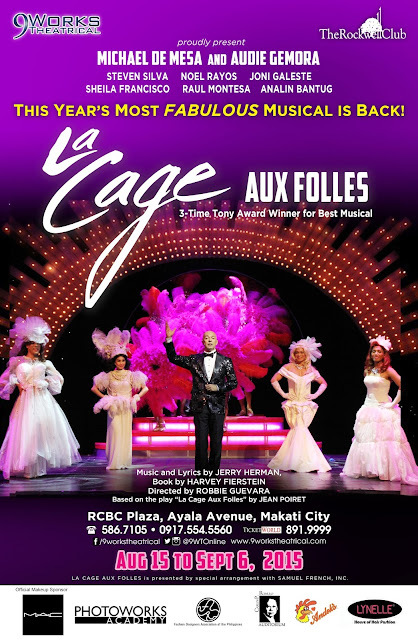 Based on the 1973 French play by Jean Poiret, also the inspiration behind the Robin Williams’ starrer Birdcage, La Cage aux Folles was a musical that Manila audiences wholeheartedly embraced and called their own. “How everything came together,” recalls director Robbie Guevara, “the cast, the 9PO orchestra, the production team – it was like a perfect piece of pie that everyone just gobbled up!” The talent we assembled, executive producer Santi Santamaria adds, gave us constant tearjerkers, “a whirlwind of emotions and contagious enthusiasm from everyone onstage and off.” The amazing audience reception, Robbie recalls fondly, made the sacrifices and hard work well worth it. Featuring tap-dancing, energetic musical numbers like We Are What We Are, The Best Of Times, and the anthemic I Am What I Am, and breathtaking costume changes courtesy of scenographer Mio Infante, Twinkle Zamora for costume execution, and the Fashion Designers Association of The Philippines (FDAP), the show promises to up the theatrical ante for its sophomore return, giving audiences both old and new, “a vivid, colorful celebration of theater magic” and a love story that is effervescent as it is timeless. “For those who have seen and enjoyed the show, this is one musical you may want to consider watching again before it gets restaged after another 20 years,” says Santamaria. “Add that to the uncanny chemistry between acting juggernauts Audie Gemora and Michael de Mesa on stage,” he shares, and you’ve got time in the theater that is time well spent. 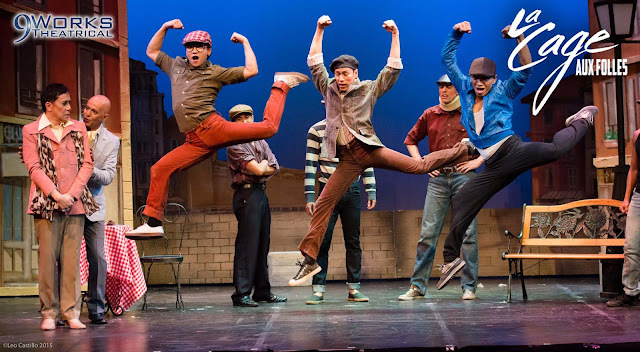 Appearing alongside Audie Gemora, Michael de Mesa, Steven Silva and ballerina Joni Galeste are some of today’s most respected and up-and-coming theater performers. Theater veterans Raul Montesa and Sheila Francisco star as Jean-Michel’s ultra conservative in-laws Monsieur and Mademoiselle Edouard and Marie Dindon. Miss Saigon alumna Analin Bantug returns to the stage as restaurant owner Jacqueline while Hong Kong Disneyland performer Noel Rayos plays Jacob the butler. Joining them are the iconic Les Cagelles played by JP Basco, Mara Celine Javier, Randi de Guzman, Carlos Deriada, Chesko Rodriguez, Dindo Divinagracia, Cheeno Macaraig, James Stacey, Arnold Trinidad, PJ Rebullida, and TV and film star Rafa Siguion-Reyna. La Cage aux Folles will be directed by Robbie Guevara, with scenic and costume design by Mio Infante, and special participation of the Fashion Designers Association of the Philippines; choreography by Arnold Trinidad, PJ Rebullida, and Yek Barlongay; musical direction by Joseph Tolentino and Sweet Plantado-Tiongson; lighting design by Martin Esteva; technical direction by Dong Calingacion; hair and makeup design by Myrene Santos; and additional costume execution by Twinkle Zamora; photography by Leo Castillo and graphic design by Larry Palma. 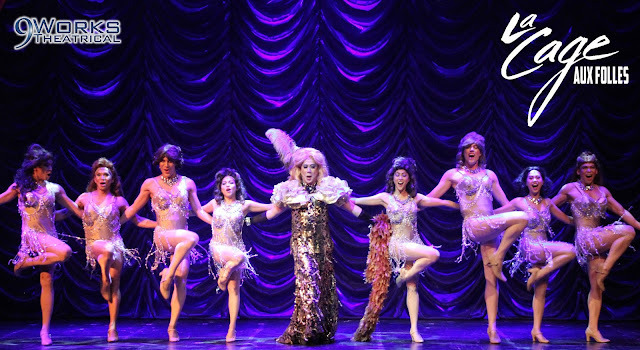 La Cage aux Folles will be shown at the RCBC Plaza, Makati on August 15, 16, 22, 23, 28, 29, 30, September 4, 5 & 6, 2015, with Friday and Saturday galas at 8:00pm, selected Saturday matinees at 3:30pm, and Sunday matinees at 4:00pm. 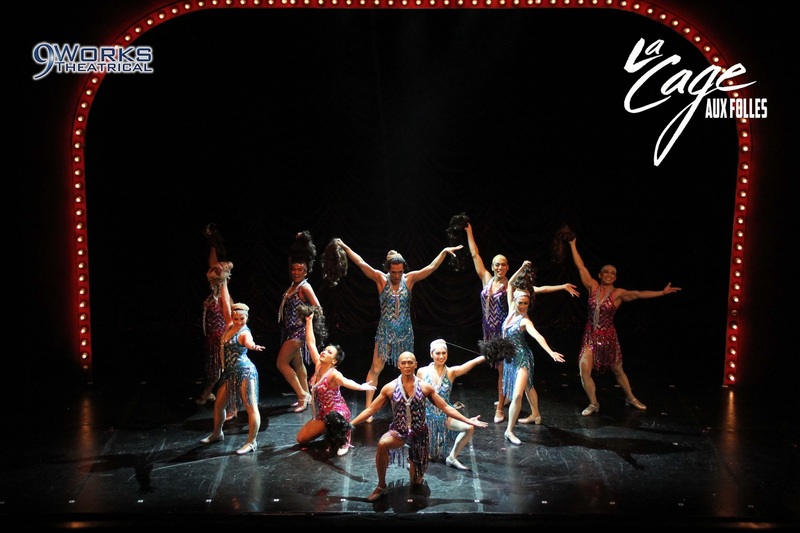 LA CAGE AUX FOLLES is presented by 9 Works Theatrical and The Rockwell Club, with MAC Cosmetics as the Official Makeup Sponsor. Official photos by Photoworks Academy.